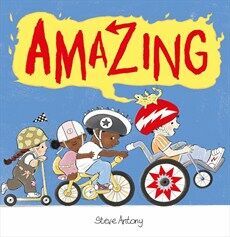 Today it’s my stop on the blog tour for Steve Antony’s glorious new book, ‘Amazing.’ We are big fans of Steve and were thrilled to welcome him to the school last year, so the excitement was high at getting a sneak peek of his latest book at storytime this week. 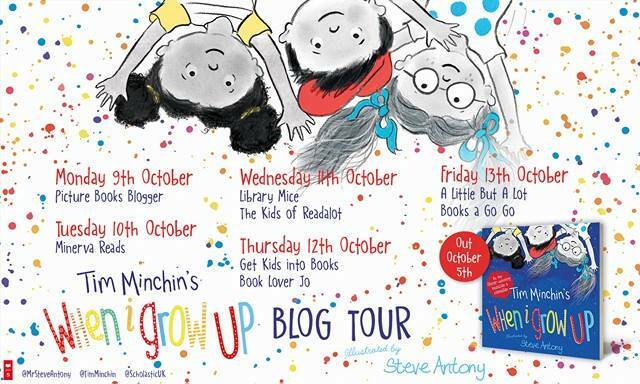 The children were really engaged and entertained by this diverse and thoughtful story which celebrates children being loved for just who they are as individuals. 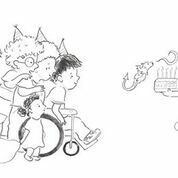 The little boy and his pet dragon Zibbo do everything together: play hide and seek; sing; dance but most of all they love birthday parties. But when the birthday cake arrives it all becomes much too exciting for Zibbo, causing much laughter with the children. We loved sharing this story, especially learning to roar incredibly loud just like Zibbo! 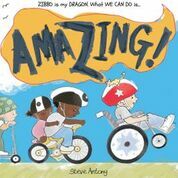 To celebrate the release of ‘Amazing,’ I have a special guest post from Steve about the creation of this stunning book. I have stacks of used sketchbooks. A3, A4, A5. Spiralled, stapled, string-bound. Sometimes I share them at author events or creative workshops. But there is one very special sketchbook that only a handful of people have seen. It’s the one where Betty Goes Bananas, Monster in the Hood and Green Lizards Vs Red Rectangles were born. It is crammed with layers of character ideas, half-baked stories, chapter book concepts and a little bit of poetry. It’s around 8 years old, and I’m constantly adding things to it with Sellotape and paperclips. Every four to five months I take this sketchbook to London to show my publisher and/or agent new ideas. I wrote and illustrated Zibbo before my picture book debut and all my other books. So why did it take so long for me to show it to my publisher? To explain this, I’ll need to hop back in time to March, 2012. I initially had the idea while studying for my MA in Children’s Book Illustration at Anglia Ruskin University. I love picture books, but I was very aware that minority groups are rarely depicted in them, especially in an incidental manner. I researched authors and Illustrators like Ezra Jack Keates who wrote and illustrated the first picture book to feature an African American as a main character in a mainstream picture book (The Snowy Day). 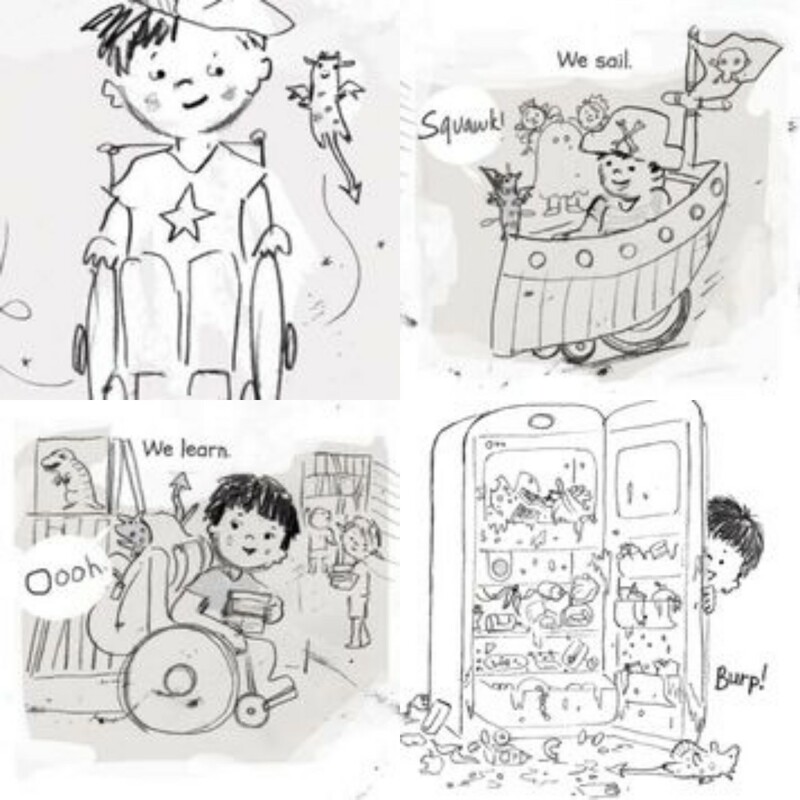 Picture books featuring LGBTQ+ characters were few and far between, and picture books featuring disabled characters rarely depicted them in an incidental way. In fact, I couldn’t find one UK trade picture book that featured a wheelchair user on the front cover of a book that wasn’t an ‘issues’ book or about being disabled. There are good books featuring disabled children (Susan Laughs by Jeanne Willis and Tony Ross springs to mind as a great example) but I wanted to create something that I couldn’t find. Book Fair to show publishers. I showed Zibbo to four or five big publishers. One said it was possibly “too niche” and potentially a “hard sell”. Others were more positive, if a little reluctant. One called it “brave”. I showed my now agent Elizabeth Roy the book. She loved it (she signed me shortly afterwards). I must stress that all the publishers were lovely and helpful. I understood (or at least tried to understand) why some of them thought Zibbo could be a risky debut. So, upon my return to the UK I listened to my gut and personally decided to shelve the story in order to further develop other ideas including a story about a panda and one about the Queen. One year later, my debut The Queen’s Hat published. Suddenly I was super busy and working on sequels and new books. Before I knew it, I was illustrating Tim Minchin’s When I Grow Up. But I hadn’t forgotten Zibbo, I was just far too preoccupied to revisit the story. As you can imagine, I was delighted when my publisher said she’d like to publish Zibbo. We agreed that the story needed fleshing out a little and the whole thing needed redrawing (I’m much better at drawing children now than I was back at uni). We also agreed that it needed a new title, something that really captured the essence of the story. 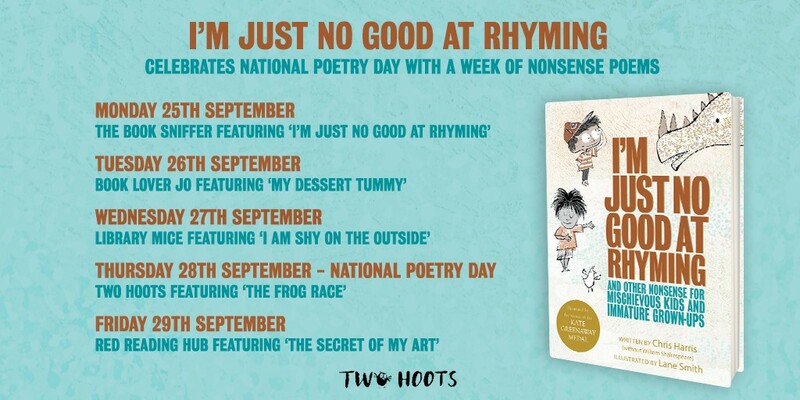 Incidentally and around the time I was redeveloping Amazing, the National Literacy Trust auctioned off the chance to be featured in one of my forthcoming books. A mother won this auction, and so I drew her son, Toby, into the story. In the book’s party scene, he’s the child wearing a yacht on his jumper. The book is also dedicated to him. It took a while to perfect the pacing and figure out all the scenes, but after several rough storyboards the book was almost finished. There was just one thing left to do: think of a new title. An amazing title for a story about an amazing dragon and his equally amazing best friend. 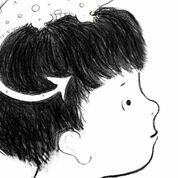 Huge thank you to Steve for this really insightful and informative guest post and for sharing these original illustrations, I’m so pleased that the little boy and his dragon finally came to life. 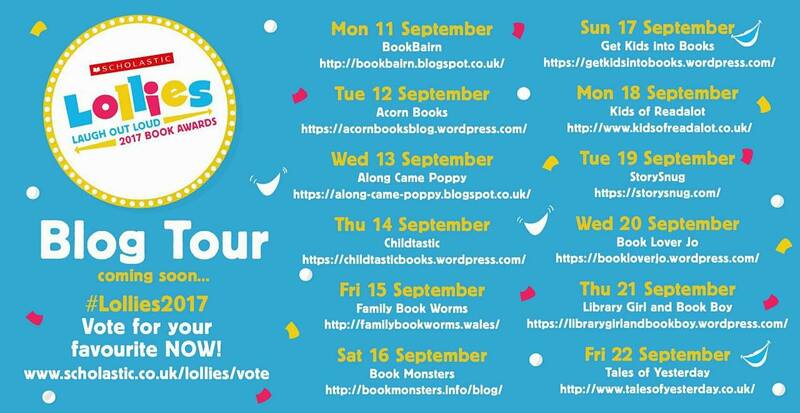 Why not join with the rest of the blog tour for more reviews and guest posts. 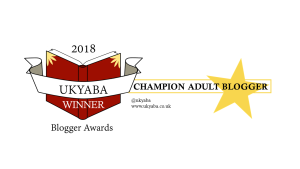 Thank you to Alison and Hachette for inviting me to join in with the blog tour and for gifting me a copy of the book in exchange for an honest review. 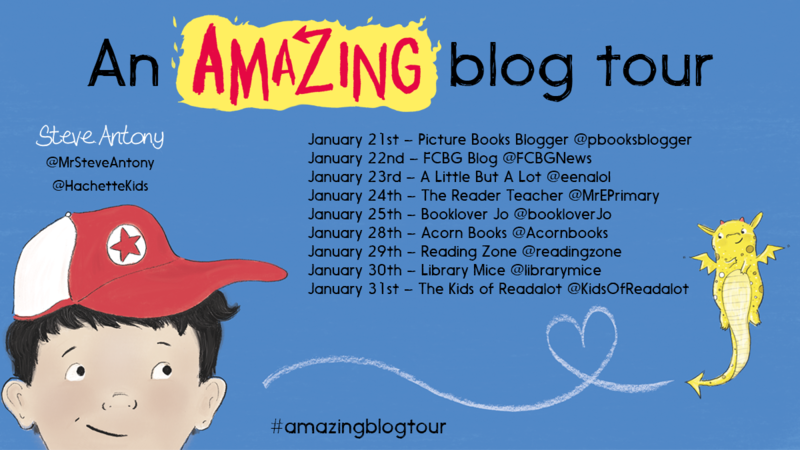 ‘Amazing,’ is available to buy now online or from any good bookshop. 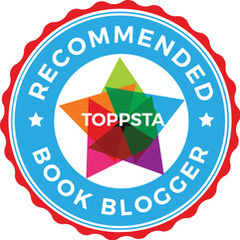 This entry was posted in Uncategorized on January 25, 2019 by bookloverjo.